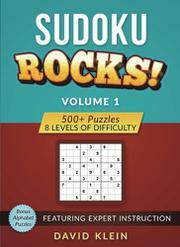 Run out of sudoku puzzles to solve? Here are 530 more of wildly varying difficulty, along with some techniques for mastering them. Klein follows up his excellent Sudoku: Its Power Unleashed (2016) with this new collection of puzzles and an abbreviated treatment of sudoku instructions. The puzzles range from the very easy to the incredibly difficult—the 12 “super extreme” puzzles, the author reckons, are so hard that only the best players can solve them and only with “lots of time and grit.” They include some with letters and letter-number combinations that contain coded phrases and math equations. Like Klein’s previous book, this one is distinguished by its clear and highly accessible treatment of sudoku theory and practical solving strategies. He begins with an explanation of sudoku rules and a breakdown of the “elements”—rows, columns, and three-by-three boxes—that structure the nine-by-nine sudoku grid. The bedrock of his system is to start by writing out the “candidates”—the potential solution numbers that aren’t ruled out by those initially included in the puzzle—in all the blank squares. The intricate logical deductions required to solve harder sudokus are thus systematized into a search for patterns among candidates. These methods range from the simple to the more sophisticated, which include the “naked twins” pattern, the occult “hidden triplets,” and the byzantine “X-Wing” pattern. Unfortunately, in this volume, Klein leaves out the most advanced pattern-recognition techniques, directing readers instead to his website or previous book to read discussions of them. This is frustrating because the “genius” and “super extreme” puzzles in the book require readers to understand some unexplained patterns, such as “Unique Rectangles,” “XYZ-Wings,” “Forcing Chains,” and “Swordfish.” Still, the techniques Klein does divulge here make sudoku-solving a lot more straightforward, and they will give novices a solid basis for progressing in the art. More tantalizing mind candy for those with time on their hands, despite some incomplete explanations.